Akvo RSR (Really Simple Reporting) is a web platform that allows organisations working in international development to come together and share progress on networks of projects around the world. Today, seven years after its launch, there are now 3,240 projects on the platform, with a combined value of over €1.4 billion. A map function allows users to search for projects, programmes, organisations and sectors, whilst seeing precise locations of where projects are taking place. Each project has its own webpage, which includes project summaries, project dates, financial information, and other project information. Reporting organisations can also include live updates on the project, like photos and videos, enabling other collaborators to keep up to date with developments. When project data is entered into RSR, it is converted into IATI formatted data, which means that organisations using RSR don’t have to carry out duplicate reporting to the IATI Standard in a separate process. It also allows data in RSR to be easily compared with data published by other organisations reporting their development cooperation activities to IATI. As Akvo explain on their website, the more organisations that publish to IATI, the more comprehensive a picture you can build of who is working on what in different countries. This in turn enables governments to know who is working in their country, citizens to hold governments and service providers to account, and NGOs to showcase their work and become more accountable to their donors. There is also a huge benefit in terms of increasing collaboration and learning between organisations when they share comprehensive data. Project Editor – this allows organisations to add, edit and publish project data directly. It is divided into user-friendly sections with guidance that makes it easier for organisations to fill in the data, with progress bars to indicate how many mandatory fields have been completed. Meeting IATI publishing requirements – recognising that more of their partners wanted to publish to the IATI Standard, RSR 3.0’s project editor allows organisation to publish more complete information that meets IATI’s requirements. This is done through a simple option to show extra IATI fields in the project editor area of the website. Further developments are envisaged for the coming months, including a system that will visualise the results of each project, showing how organisations and projects contribute to specific goals. How are organisations using Akvo RSR? Cordaid is one of the Netherland’s largest development aid organisations, focusing on development and collaboration in vulnerable regions and areas of conflict. In 2012 they went through a reorganisation process, with the aim of increasing their openness and communicating more about the work they do (see more about Cordaid’s work on open data here). As part of this process, they redeveloped the website, allowing the public, funders and partners greater access to project information. Akvo’s RSR tool was integrated into the website along with Akvo’s own project management system, allowing staff from countries around the world to report more easily, and in line with the IATI Standard. 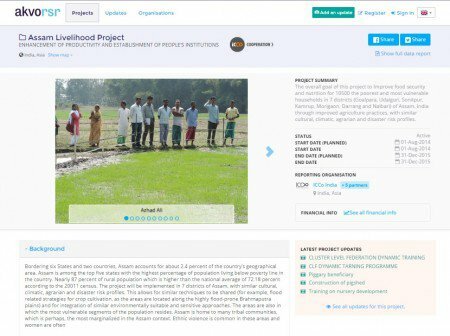 Cordaid’s project portfolio is now visualised on their website, allowing users to easily search for projects and see essential project information ranging from budgets, locations, goals and partners. This has created a linking and learning tool between implementing organisations and a level of accountability to the public and other interested stakeholders. 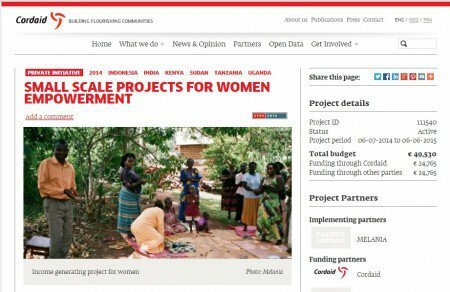 According to the Cordaid website, the project updating process is incredibly simple, and can be used by a range of staff and partners in the Netherlands and in the field, giving a voice to all those involved: “anyone can do it, it is simple”. There is also hope that using the update function will allow Cordaid to start measuring impact, by capturing evidence from beneficiaries and enabling them to be story-tellers about how the projects affect their communities and their lives. The United Nations Human Settlements Programme (UN-Habitat), an IATI publisher, have been visualising their IATI data through Open UN-Habitat. Additionally, they have started using Akvo RSR to report on activities under one of their programmes, the the Lake Victoria Water and Sanitation Initiative (LVWATSAN) in Uganda, Kenya and Tanzania. The project is intended to reduce the pollution that flows into the lake, improving sanitation and water infrastructure in the Lake Victoria Basin. They are currently reporting 29 projects from the LVWATSAN programme, covering 10 towns, with plans to expand publication. The UN-Habitat projects in RSR are soon going to be linked to the Open UN-Habitat portal, so that it is simple for users to move between the high-level programme information and the more detailed information about the individual projects taking place in country. This enables users to track the project directly down to the beneficiary communities, capturing a fuller picture of the way resources are being used. 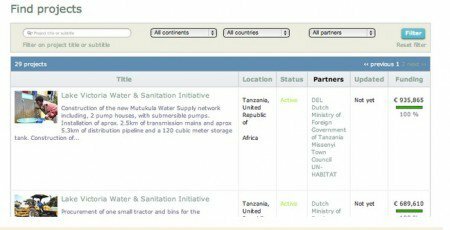 You can find further examples of organisations using Akvo RSR on the website. Both of these examples are really exciting steps for those data users who hope to hold donors to account for the way funds are spent. Akvo refer to this process as “end to end transparency”, a process that interlinks information from many organisations involved in development cooperation, allowing money and activities to be traced through the system. For Akvo, strengthening results reporting in development cooperation is essential, both using the IATI Standard and beyond. They want to see more data that focuses on the details of project implementation, in order to provide greater disaggregation and understanding of the work happening on the ground. By integrating data published at the top of the development chain (e.g. through the IATI Standard) with better data on project progress and results, it will be more feasible to drill down through the development chain and understand where money has gone and what its impact has been. For further information about the Akvo RSR, visit their website http://www.akvo.org or keep following the IATI blog to find out more about how organisations are making their IATI data more accessible to users.